There is a MODERATE avalanche danger today in the Turnagain Pass region where 8-10" of new snow and wind has formed sensitive wind slabs. These slabs are expected to be 8-14" thick and easy to trigger on slopes over 35 degrees. In areas where the wind has not affected the snow, sluffs should be expected and large enough to be a legitimate concern in steep and sustained terrain. Keeping a close eye on the new snow and watching for, and avoiding, any wind loaded slopes will be the key for a fun powder day. ***If you are headed to Hatcher Pass today, there is a HIGH avalanche danger. Please see the Hatcher Pass Avalanche Center website for more details. On the heels of this much anticipated new snow has been a cold Northwesterly wind. The winds produced plumes off some, but not all, peaks in the region yesterday afternoon and have continued to blow in the 15-20mph range overnight. This is prime speed for wind slab development and human triggered wind slab avalanches should be expected. Additionally, this flow direction is ideal for loading the East face of Seattle Ridge. Yesterday, we were able to find and trigger a small wind slab just before the winds kicked up. Today, these types of avalanches should be a dime a dozen and easy to trigger. Slab depths are on the shallow side, 8-14", yet could be stiff enough to support the weight of a person; this is concerning as the slab may allow someone on to it before breaking above them. The good news is, wind slabs should be easy to identify with their smooth rounded surface and upside down feel (harder snow over softer snow). Quick hand pits are a great way to see how the new snow is acting and I'd recommend a number of these as you move through the mountains. Photo below is of an easily skier triggered soft wind slab yesterday on Sunburst's Southwest face (3,000' average depth 10"). 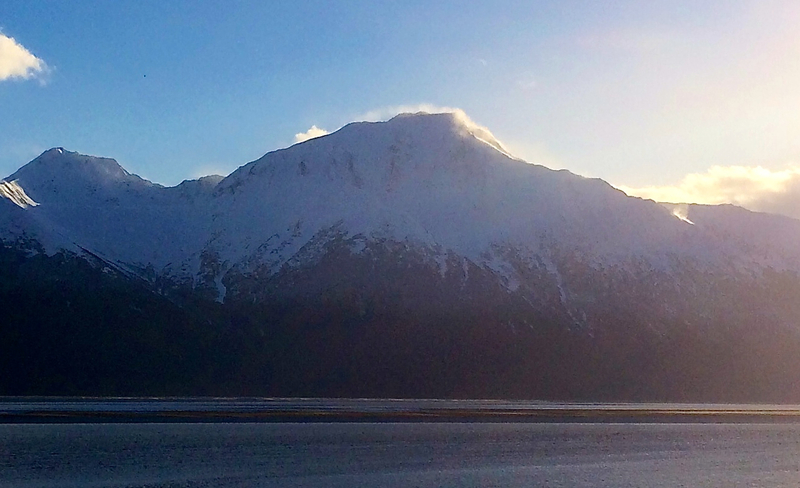 Winds transporting snow on Mount Alpenglow yesterday afternoon. Watch your sluff. Sluffing in Friday/Saturday's storm snow was prevalent yesterday and will be again today. These sluffs are entraining a significant amount of snow on sustained steep slopes and in channeled terrain. The cold temperatures will help to keep sluffs on the radar. It is very nice to finally have some new snow to report. Besides the storm totals above, see the chart below for the past 24-hour totals. The rain/snow line with this event hovered between 500 and 1,000' and 3" of wet snow (which has now frozen) fell at the parking lots at Turnagain. Snowfall shut down around noon yesterday and was followed by a switch in wind direction from the South to the Northwest. Cold air has and is currently being ushered in by the Northwesterly flow. Today, visibility should be good with mostly sunny skies and a few lingering clouds. However, the cold Northwest winds are expected to remain in the 15-20mph range with higher gusts. Temperatures will continue to drop through the day into the teens at most locations, then to the single digits by tonight. As we head into the early part of this week, no precipitation is expected as we will remain in a cold and blustery Northwest flow.